When the news broke just over 24 hours ago that a major earthquake had hit in Haiti killing thousands, downing buildings and crippling an already fragile infrastructure, news networks immediately began questioning how aid would arrive and from where. While nations got busy responding with assurances and pledges of support for the citizens of Haiti another call, or rather text, was going out to raise money and support for Haitians by company called mGive, which in just one day had raised $1.2 million for Red Cross via text messages to text Haiti. (Read an update from Daily Finance). The premise is simple. Text "Haiti" to 90999 and your cell phone bill will receive an extra $10 charge, all of which will be passed on to the Red Cross without so much as a penny staying with your cell phone carrier or mGive. Why has this call to action been so popular? It's simple, according to San Francisco native Xavier Lanier, who donated today. He told WalletPop via Twitter that he donated to text Haiti "because it was easy," and he's not alone. 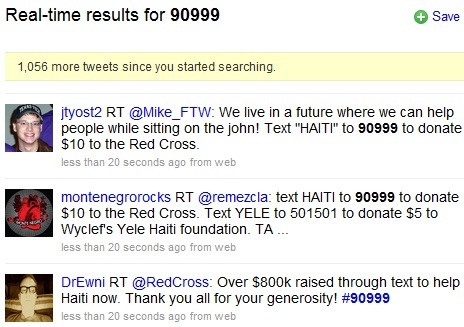 A search on Twitter of the text number 90999 revealed an incredible number of results and an additional 1,000 tweets about text Haiti coming in during 10 minutes spent editing this post. The ease of donating to an incredibly worthy cause combined with the simplicity of it all led to a stunning show of support, but unlike other socially-backed shows of support like declaring your bra color for breast cancer, joining a Facebook group or adding a Twibbon to your Twitter avatar, users showed up in force donating to the Red Cross in droves and spreading the word on Twitter and Facebook to text Haiti. When compared to the slacktivism which is often part of social media campaigns, it appears that the Twitterati have finally put their money where there Tweets are. What are you waiting for? Text Haiti to 90999 to donate $10 to the Red Cross for Earthquake relief in Haiti, it only takes a second. Still have questions? Check out the mGive Haiti FAQ.